Happy Holidays all you wobble fans! I just love the Holidays even though in Florida we dont truly get to enjoy the real "White Christmas". But on the days when it is cold Florida style there is nothing better than enjoying a cup of hot cocoa and sitting outside by a fire. So, I thought what else could I do or where else could I use my wobbles. I made a cocoa mug out of a mason jar and put a funny little character on the front for my niece and nephew. Then I glued a handle to the side. Which actually is a drawer pull I bought from Alpha Stamps. I thought this came out super cute and they would make a great gift as well. 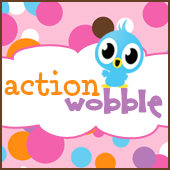 Happy Wobbling and remember if there is a spot big enough for a wobble then Wobbelize!!! Everyone Wobbelize!! Super Duper Cute!Love this idea!! Monica - isn't that the cutest! Thanks for sharing because I love to wobble! Have a nice weekend! Very cute! Love the reindeer!